DUBLIN CITY COUNCIL is ploughing ahead with its latest plans for a plaza in College Green area – and it wants to know what you’d do with it. 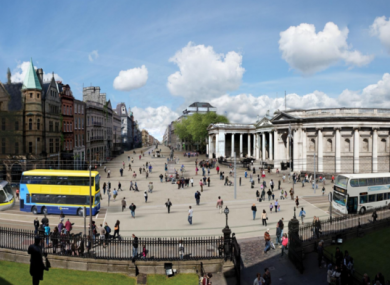 Under proposed traffic management measures, a civic plaza area would be created in College Green which would see all traffic except pedestrians and cyclists being removed from Church Lane to lower Grafton St.
A public workshop on designs for the plaza will be held on 17 November, and people are being asked to come along and bring their ideas. The plan is the result of consultation between Dublin City Council, the National Transport Authority and Dublin Bus on facilitating the Luas Cross City once it is launched next year. Initially DCC said that it was anticipated that the proposal would be completed and in place by early summer 2017, “to align with the Luas Cross City construction and testing program”. However, yesterday the council confirmed that it is anticipated to be in place by 2018. Brendan O’Brien of Dublin Council said that this is due to the fact the plans are to be sent to An Bord Pleanála rather than the councillors. He told TheJournal.ie that the plan is set to go to the bord hopefully in March 2017. “It depends on how quickly the bord makes its decision, but we would hope that if the bord make their decision toward the latter half of 2017 the actual traffic management changes can be [in by] the end of 2017,” he said. A screening report on the environmental impact of the plan said the route they should be going is through An Bord Pleanála rather than councillors. The council is currently compiling the environmental impact assessment, and the statement on this will be lodged in March. After this, a period of formal public consultation will take place, and it’s anticipated this will take around five to six months. But before all this there will be a public event in the Mansion House on 16 November. This is for people to think about the space and discuss what sort of uses would be best for it. “If the space was available, what are the things the design team would need to be considering for that space?” explained O’Brien. “[The meeting is] not statutory… it’s to engage with people.” He said the council wants to get as wide a group of people as possible to think about the space, as their thoughts will be sent to the design team who will be appointed in December. The event requires online registration. The plan will mean “a space outside College Green which we’re not allowing vehicles to drive through, so that becomes a space for a plaza or for whatever way you want to describe it, for the city,” said O’Brien. We are interested what people would like to see in College Green or what their view is. If this space was available, what way could it be used – that’s the theme of that event, so it’s not looking at traffic management or bus routes. He added that the space “will provide a safe area for people to move around the city”. The plan will encompass a 2.5 hectare area and will see some buses re-routed, with a turnaround arrangement being brought in to the west of College Green to allow some routes to move their terminuses to Dame Street. This change of use of College Green presents an important opportunity for the city to redefine this area as a Civic Space of National importance in line with the City Council’s long standing objective for College Green. The implementation of the proposed traffic management measures “will open the way for a complete redesign of this space”, it said. Email “What would you use the pedestrianised College Green plaza for?”. Feedback on “What would you use the pedestrianised College Green plaza for?”.